Today was one of those days where it's nice to just hang out in the garage and run some trains. So I did and ran the full schedule in a little under 4 hours. My objective was to give my recent digital conversions some work-out, and see if there are any problems cropping up. 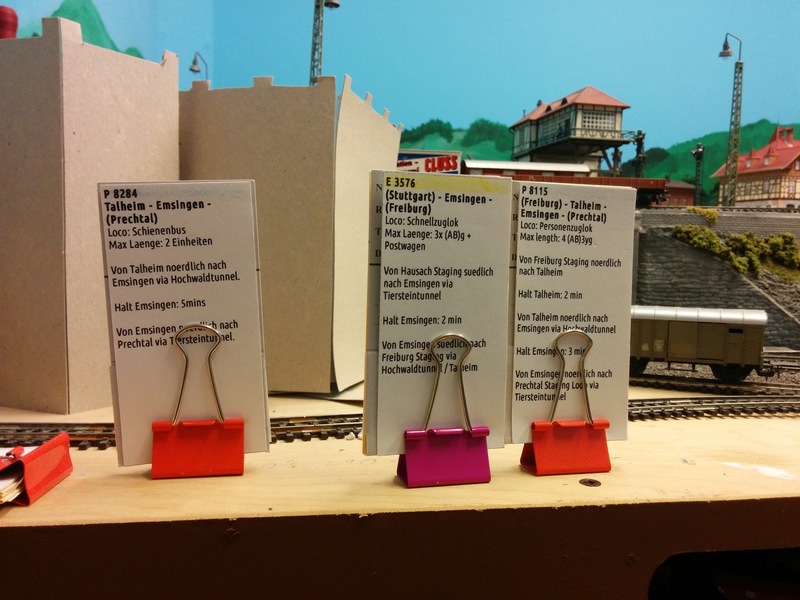 Here's a selection of the instruction cards for the train crew. I used the German version today, but also have a complete set in English, used depending on who comes to visit to run trains. These cards give detailed instructions for each train, its make-up, limitations, route, stops, as well as special instructions as needed. Ng 83746 from Prechtal arrived a little while ago. 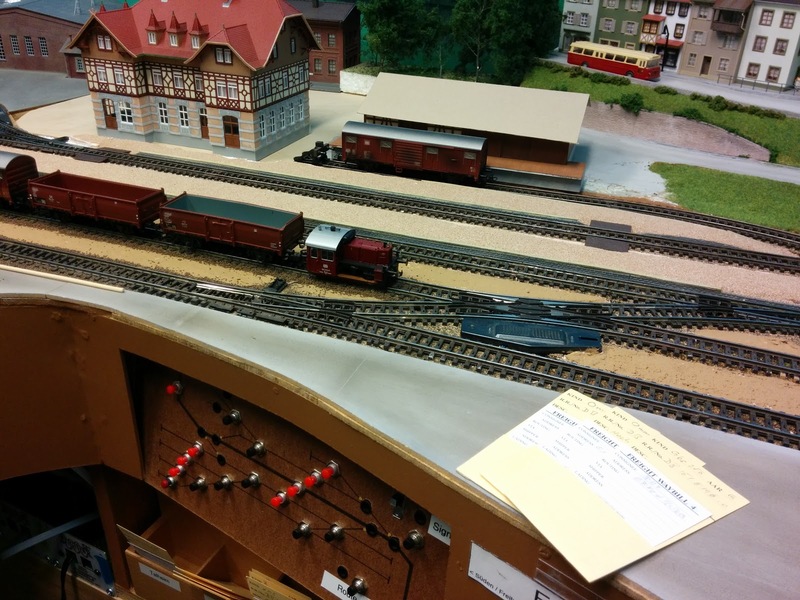 After the engine uncoupled and moved over to the Lokstation for servicing, the Koef II is taking care of the cars and sorts them into the right yard track. For now I'm using the ubiquitous MicroMark car card and way bill system, although I'm thinking about how to make something with a more distinct German flavor. The Koef performed well, but had trouble when pushing 5 cars uphill on the north-side of Emsingen as part of the switching chores for local freight train (Nahgueterzug) Ng 83 720. 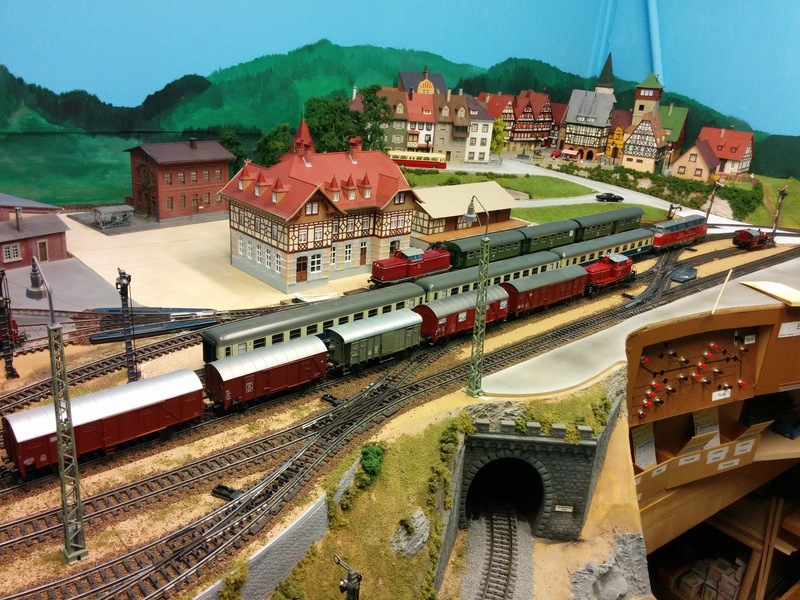 It was doing fine with 5 cars on level track, but going up the slightly uphill track was too much. It doesn't have any traction tires, so the wheels start slipping, just like the real thing. 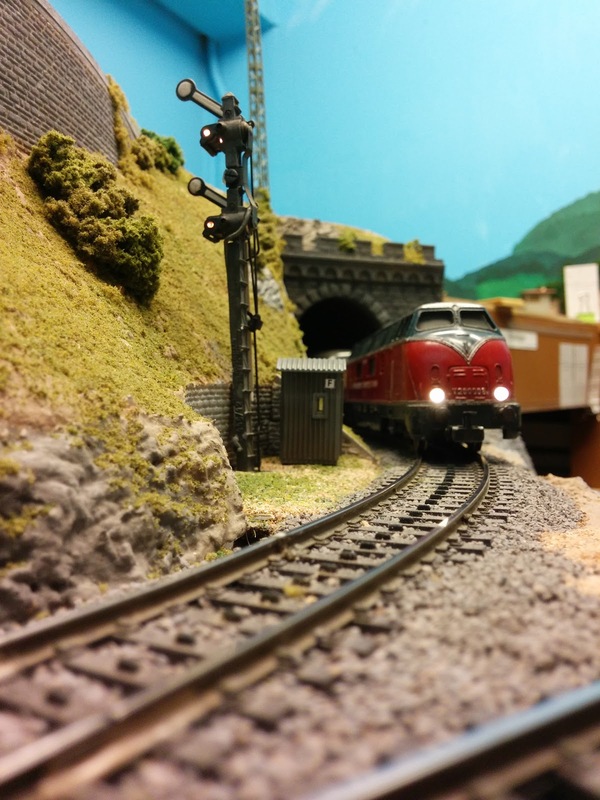 The power pickup is tough around turnouts, so I will order a buffered Lokpilot4 Micro for this little locomotive. The next Ng was switched with 260 417, which was a joy to operate. Northbound fast passenger train (Eilzug) E 3579 led by V200 006 meets southbound local passenger train (Personenzug) P 8176. 260 417 has just completed its transfer run (Uebergabe) from Talheim and waits on track 3 for the passenger trains to clear the station. Koef II is parked at the end of the track on the north-end of Emsingen.